Ubisoft today shared the patch notes for update 5.1, which deals primarily with bug fixes, rather than adding new features. Ubisoft today shared the patch notes for update 5.1, which deals primarily with bug fixes, rather than adding new features. It's not the one adding the new Bartlett University map; that's update 5.2. It does, however, make some significant changes to how the vote-kick system works. In Ranked matches, it simply won't--vote-kicking has been disabled for the time being. "Since its implementation, we have noticed abuse of the Vote to Kick feature, especially in Ranked matches where there is a stiff penalty," Ubisoft explained. "While we are still looking at other ways to implement a system that will allow for a more pleasant player experience, we found it necessary to remove this feature in Ranked for the short term." Casual matches won't lose vote-kicking altogether, but the number of votes required to boot someone will be increased. A specific number wasn't shared; Ubisoft only said it's going up "depending on the size of the grouped and un-grouped members." On the bug-fix side, there are a wide range of changes. Some of these apply to the new Red Crow Operators and map--a "major" PS4 freezing issue with Hibana's gadget has been resolved, as have problems with Echo's Sonic Burst. You can see the full list of changes below. All of this arrives as part of update 5.1, which is slated for release on PC, Xbox One, and PS4 on Tuesday, November 22. Since its implementation, we have noticed abuse of the Vote to Kick feature, especially in Ranked matches where there is a stiff penalty. While we are still looking at other ways to implement a system that will allow for a more pleasant player experience, we found it necessary to remove this feature in Ranked for the short term. In Casual, we are increasing the number of votes required for a Vote Kick to pass depending on the size of the grouped and un-grouped members. Fixed -- Attempting to breach without detonating the breach charge in the rappelling swing motion breaks the Operator's animation. Fixed -- The hitbox surrounding Castle's headgear is not accurate. Fixed -- Melee range is extended when striking from a low stance to a high stance. Fixed -- Users are not able to stand up when pressing [Shift] while prone in Barbed Wire. Fixed -- Holes created by Impact grenades do not reliably replicate the destruction on all clients. Fixed -- Throwing multiple gadgets at the same location in succession results in unexpected collision. Fixed -- Dying at the same moment as throwing a gadget will result in a duplicate of the gadget. Fixed -- Placed charges remain floating after the surface has been destroyed. Fixed -- Operator's weapon disappears when attempting to pick up a gadget and then cancelling immediately. Fixed -- Changing the Action Phase Duration from 360 to 600 seconds results in the incorrect time being displayed. Fixed -- Abandon Match quit option persists into the next game session. Fixed -- Caster can be muted in the lobby even if voice chat is not functional. Fixed -- Players are stuck in the defuser placement animation if attempting to place the defuser on a ballistic shield. Fixed -- When Echo has his secondary weapon drawn, the animation for destroying the defuser is broken. Fixed -- The hostage is shown with the defuser icon on the HUD. Fixed -- Auto-reload is disabled for ballistic shield Operators carrying the Hostage. Fixed -- Players do not receive points for discovering the objective. 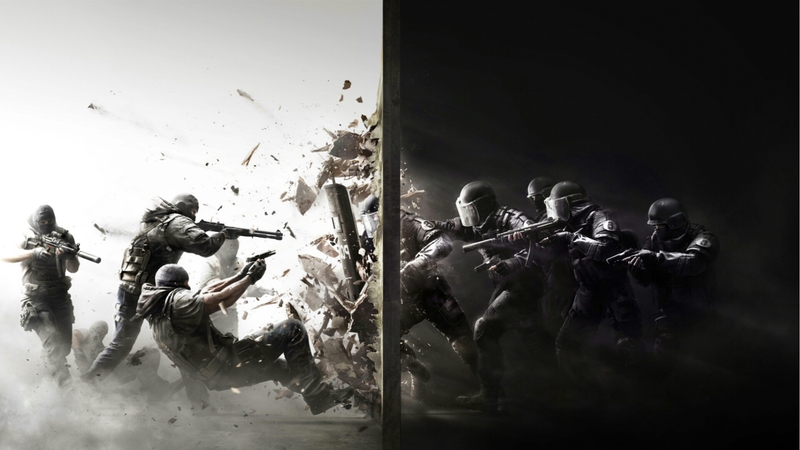 Fixed -- Sledge's hammer cannot destroy Mute's Jammers. Fixed -- Major freezing issues occurring on PS4 when Hibana fires her X-KAIROS gadget for the first time. Fixed -- The sound effect of the X-KAIROS gadget can be heard across the entire map. Fixed -- Pellets do not stick to the corners of trap doors properly. Fixed -- Sonic Burst is not providing the intended effect on players that have been impacted. Fixed -- Sonic Burst does not impact players as intended if Echo shoots them in the shoulder. Fixed -- Player animation is not working as intended after being struck by Echo's drone. Fixed -- No sound is made when placing an Exothermic charge on a reinforced wall while rappelling. Fixed -- If Doc is downed while healing himself, he will enter a DBNO state, but will not be down. Fixed -- If IQ goes prone while ADS, her gadget will stop displaying distances and outlines. Fixed -- Once destroyed, cameras still appear on IQ's gadget. Fixed -- Players are able to use Twitch drones as support cameras. Fixed -- Picking up her Shock Drone and pressing the action button at the same time results in Twitch being stuck in an animation. Fixed -- Jammers do not block remote triggers if Operators stand within the Jammer's radius. Fixed -- Cluster Charge does not make holes in trap doors. Fixed -- Pressing the left and right button quickly results in a broken animation. Fixed -- Level of detail issue on multiple shadows. Fixed -- Players are able to vault into wooden beams, causing a clipping issue. Fixed -- Drones do not have proper collision with the Western Tower. Fixed -- Users can remain stuck when vaulting over the bar. Fixed -- X-KAIROS pellets detonate instantly in Aunt's Bedroom. Fixed -- Vaulting animation is broken when vaulting through Spa Deck's windows. Fixed -- Fuze is unable to deploy Cluster Charges on Spa Deck's windows. Fixed -- Players experience rubber banding when passing through 3F Global Hallway breaches. Fixed -- Echo's drone does not experience proper collision with some ceilings. Fixed -- Bullet effects can extend outside of the walls. Fixed -- "Destruction Master" Ubisoft Club Action is not unlocked if the player dies while breaching. Fixed -- Players can sometimes be stuck in their own corpse after changing cameras. Fixed -- Textures disappear from Hibana's hood when viewing from a distance. Fixed -- Players are able to disable all maps in the matchmaking preferences. Fixed -- Capitao's ammo count displays as 3/-1. Fixed -- Weapon crosshairs are displayed when viewing a teammate's drone during the preparation phase. Fixed -- When performing a one shot kill to the enemy's neck, the points for a headshot bonus are not award. Fixed -- Remaining rounds for the Bearing 9 shift in spectator mode. Fixed -- Inconsistency between the amounts of time displayed in "Surrender Sanction" and under "Ranked". Fixed -- Performing a melee action while firing a shotgun causes a broken animation. Fixed -- The ammo count for Capitao's tactical crossbow does not display properly when being spectated. Fixed -- Scoreboard updating is significantly delayed. Fixed -- Operators are not standing in the proper location in the MVP showcase. Fixed -- Ubisoft Club challenges are not available. Fixed -- Error 3-0x000A0003 is displayed when accepting an invitation after having gone through a suspended disconnect message.